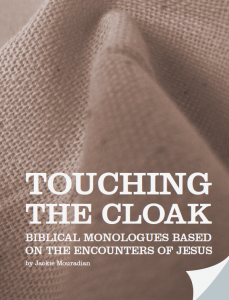 ‘Touching the cloak’ is a series of monologues based on the encounters of Jesus. There are twenty monologues in all, including the voices of Jesus’ friends, his family and those he met on his journey, who he stopped for to heal or to restore dignity and wholeness of life. This collection also includes four ‘back to back’ monologues, two different viewpoints of the same story. At the end of the book are a collection of monologues suitable for holy week and Easter. These scripts have been used in community development training courses, church services and dramatic productions in the UK and also overseas in countries such as Haiti, Kenya, Nepal and Indonesia, translated and performed by people of different cultures.